Halloween | Baking and Caking! Last Sunday, before we all parted our separate ways, my suite-mates and I all decided to have our own Thanksgiving dinner. 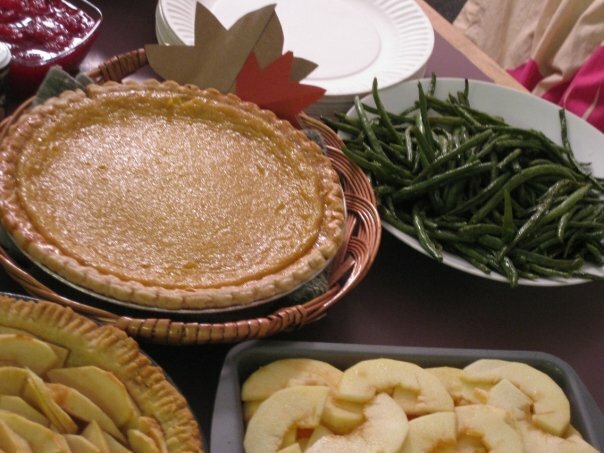 We all signed up for the classics – turkey, cranberry sauce, yams, green beans, etc. I of course, had to make a dessert. Sadly enough, on the Sunday of our meal, I was required to stay at work for a horrible little meeting to go over holiday sales. It was one of the worst two hours of my life. By the time I got back to the room, everyone was finished eating, but as amazing as they always are, all my suite-mates saved me a bit of everything. And let me just that it was all AMAZING! 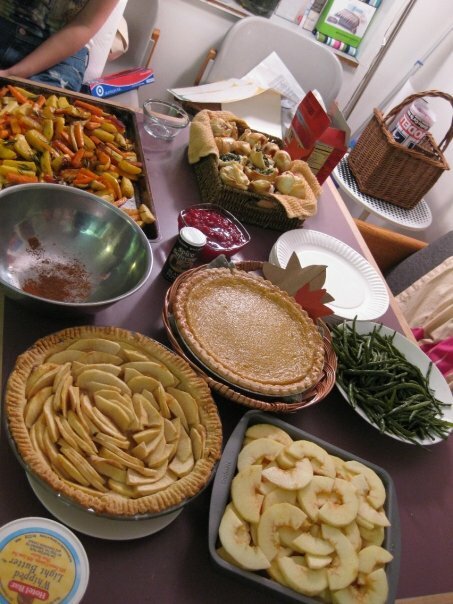 There was so much food – delicious apple yams, filo dough balls, mixed veggies and more! I gullped everything down in a matter of minutes. 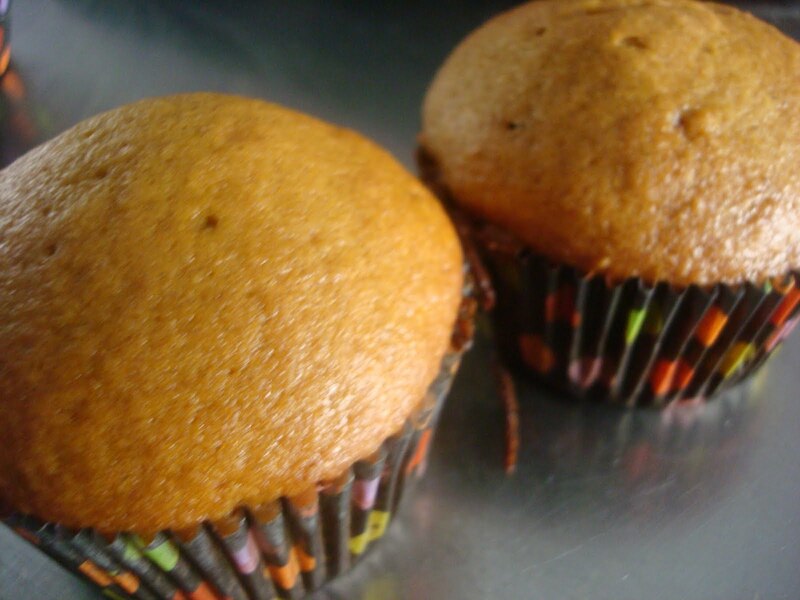 I made pumpkin pie cupcakes, which were exactly as the title puts it – mini pumpkin pies. Thankfully, knowing I was going to be late getting home from work, I made them the night before so they were ready when everyone sat down to eat. They were quite simple to make – just like real pumpkin pie but with a bit of flour and cupcake liners instead of a pie tin. They definitely sink a little bit once they have cooled off, which is why adding a dollop of fresh whipped cream on top is a must. 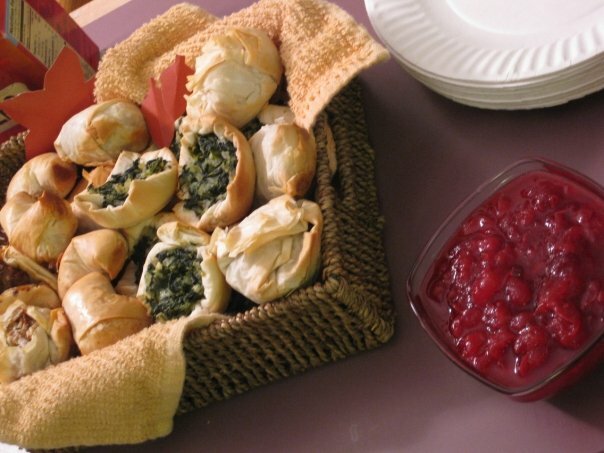 These will definitely go down in my holiday recipe cache for next year. 1) Preheat the oven to 350F. Line a 12-cup muffin tin with paper or silicone liners. 3) In a large bowl, whisk together pumpkin puree, sugar, brown sugar, eggs, vanilla and evaporated milk until well combined. 4) Add in dry ingredients and whisk until no streaks of flour remain and batter is smooth. 5) Fill each muffin cup with approximately 1/3 cup of batter. 6) Bake for 20 minutes. Cool cupcakes in pan. They will sink as they cool. 7) Chill cupcakes before serving. Top with lightly sweetened whipped cream. Interesting story, wouldn’t you say? In my continued obsession with pumpkin, as I think I’ve said ten thousand times already, I came across a recipe for pumpkin whoopie pies and knew that I had to make them. I’ve made many oreo type cookies before, put never whoopie pies. It was a very big event – Charlotte had never had a whoopie pie before and I planned my entire Friday afternoon around making them. The cakes themselves are very easy to make. I didn’t even need to take out the mix master. I didn’t have all the right spices, so I supplemented what I had for what the recipe called for. Added a bit more cinammon then needed and then used two tablespoons pumpkin pie spice instead of ginger and nutmeg. This has been one of my favorite pumpkin recipes so far because it has so many spice in it, you taste that spicy/pumpkin taste much more, as least in my opinion. The icing for the center was super easy and adding a bit of cinnamon adds to the whole idea of pumpkin pies. I love cream cheese frosting. Butter frosting is great and all, but cream cheese is just a bit more refreshing in my opinion and lighter as well. Of course, being impatient as always, I only refidgerated them for about 20 minutes before taking them out. They were good, but when I ate one after it had been in the fridge for a few hours, it was heavenly. Something about the icing hardening up a bit and the cakes being more firm made it amazing. The recipe said it would only make 12, but I got closer to 20. I didn’t think that the cakes were too small, but I guess I could have made them bigger and then had fewer total whoopie pies. Oh well. As usual, the smell that the cakes sent out from the oven were delightful. I really don’t think that there are many things in the world that smell better than pumpkin baking. 1) Make the cookies: Preheat oven to 350 degrees. Line two baking sheets with parchment paper or a nonstick baking mat; set aside. 2)In a large bowl, whisk together flour, salt, baking powder, baking soda, cinnamon, ginger, and cloves; set aside. In another large bowl, whisk together brown sugar and oil until well combined. Add pumpkin puree and whisk until combined. Add eggs and vanilla and whisk until well combined. 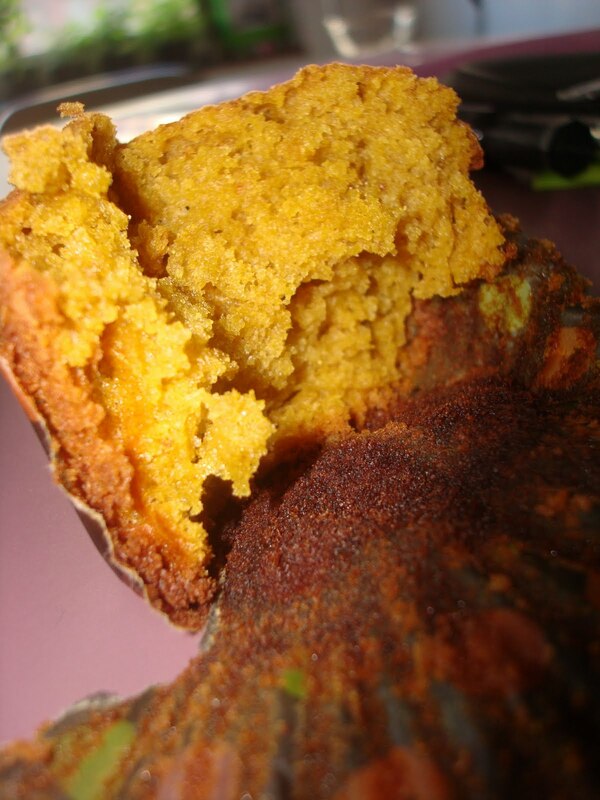 Sprinkle flour mixture over pumpkin mixture and whisk until fully incorporated. 3) Using a small ice cream scoop with a release mechanism, drop heaping tablespoons of dough onto prepared baking sheets, about 1 inch apart. Transfer to oven and bake until cookies are just starting to crack on top and a toothpick inserted into the center of each cookie comes out clean, about 15 minutes. Let cool completely on pan. 4)Make the filling: Sift confectioner’ sugar into a medium bowl; set aside. In the bowl of an electric mixer fitted with the paddle attachment, beat butter until smooth. Add cream cheese and beat until well combined. Add confectioners’ sugar and vanilla, beat just until smooth. (Filling can be made up to a day in advance. 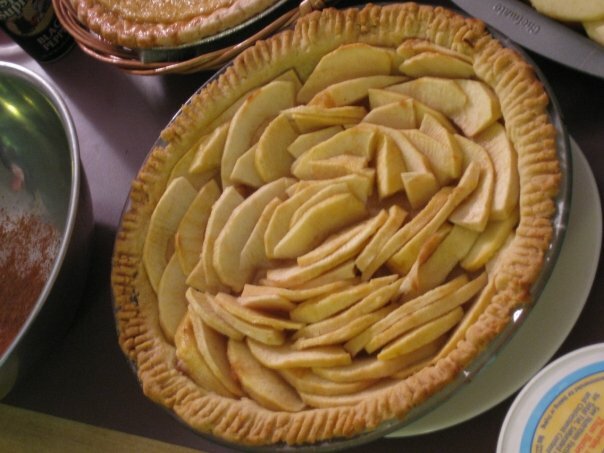 Cover and refrigerate; let stand at room temperature to soften before using. 5) Assemble the whoopie pies: Line a baking sheet with parchment paper and set aside. Transfer filling to a disposable pastry bag and snip the end. When cookies have cooled completely, pipe a large dollop of filling on the flat side of half of the cookies. Sandwich with remaining cookies, pressing down slightly so that the filling spreads to the edge of the cookies. Transfer to prepared baking sheet and cover with plastic wrap. Refrigerate cookies at least 30 minutes before serving and up to 3 days. As I’ve said before, I have an obsession with pumpkin. I’m assuming because it’s the fall season and I see them everywhere, but there is just something about anything pumpkin that gives me that lovely feeling of fall, being bundled up in sweaters and drinking hot apple cider. Anyway, I knew for floor snacks I was going to have to make something with pumpkin, so I settled on a pretty basic chocolate chip cookie, but with pumpkin as a main component. What makes these cookies special is that they are much more fluffy and bread-like then most cookies. They have a whole can of pumpkin in them, so it’s not surprising that they turned out that way. Honestly, I think they needed some more spices, because I just wasn’t getting much of a pumpkin taste in the two I tried. This could have been due to the fact that there were way too many chocolate chips, so the taste of chocolate was overpowering, but I believe that they simply needed some cinnamon, nutmeg, and cloves to spice up the pumpkin taste. Sadly, even after many days of planning and putting together floor snacks, Charlotte and I were invited to attend a taping of a comedy show down at the Skirball performing arts center on campus that ran past 8 o’clock. So while our treats were greatly enjoyed – there were no cookies left when we got back – we were unable to participate in the festivities. Oh well 😦 Hopefully we will be able to do it again next semester. 1) Position a rack in the middle of the oven. Preheat the oven to 325 degrees F. Line two baking sheets with parchment paper and butter the paper. 2) Stir the flour, baking powder, baking soda, salt and spices together in a medium bowl and set aside. 3) In a large bowl using an electric mixer on medium speed, beat the eggs and sugar until smooth and lightened in color, about 1 minute. Stop the mixer and scrape down the sides as needed. On low speed, mix the oil, pumpkin, and vanilla until blended. Mix the flour mixture to incorporate it. Stir in the chips and nuts by hand. 4) Scoop mounds of the dough onto the prepared baking sheets, spacing the cookies at least 2 1/2-inches apart. About 1/4-cup per scoop. 5) Bake the cookies one sheet at a time until the tops feel firm and a toothpick inserted in the center comes out dry, about 15 minutes. Let them cool on the sheet for 5 minutes before transferring to a rack to cool completely. It has finally started to get cold in New York. I’m so excited, because I love wearing sweaters, and scarves, and boots and everything associated with the cold. In fact, the only thing that I have bought since moving here – clothes wise – are some incredibly warms sweaters from Housing Works. 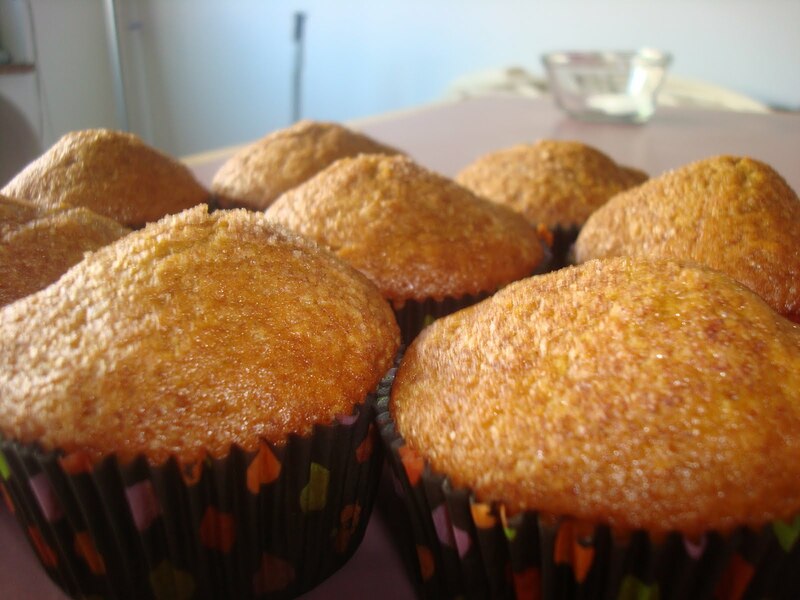 Well anyway, now that the colder are has settled in, I figured it was time to bake some pumpkin muffins. Pumpkins is one of my favorite plants ever. Questions – a vegetable, fruit, or just a squash? I feel it’s one of those things that kind of pushes the boundaries. At work, they have pumpkin truffles, which are AMAZING!! I eat one almost every day that I go into work. So this morning, I woke up – early in fact – to bake some muffins. Now as I’ve said before, my oven here in my dorm room is very faulty, so I turned the oven up a little high then 350 because I was worried they did not bake. When the first batch came out, they were a little darker then usual, but still delicious. The second batch I eyed a little more carefully and took them out the moment they started to brown. In my opinion, they were much much much better. Charlotte said they were just as good as the first batch, so I guess we all just like our muffins at different consistencies. Either way, I will definitely be making these again. Put oven rack in middle position and preheat oven toe 350F. Put liners in muffin cups.